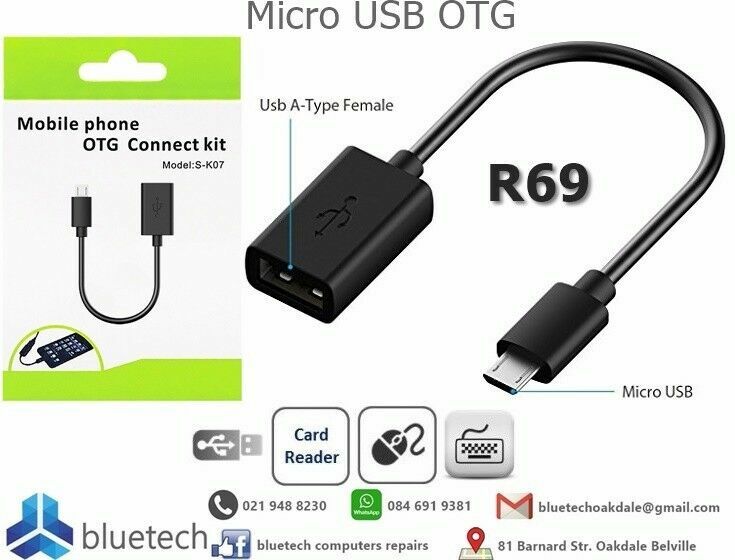 Hi, I’m interested in Micro USB OTG, Bluetech Computers 021 948 8230 . Please contact me. Thanks! The Micro USB OTG cable is an adapter which connects external peripherals such as memory cards, hard drives, keyboards, game controllers and more to your smartphone and tablet. USB On-The-Go, often abbreviated USB OTG, is a specification and standard that allows USB devices such as digital audio players or mobile phones to act as a host allowing a USB flash drive, mouse, or keyboard to be attached. *Professional Samsung smart phone repairs in Bellville Cape Town. I do repairs to all Samsung MODELS of phones and tablets... Lcds, battery replacement, network issues, top glass replacement, charging blocks, touch digitizers, water damage, back covers, unlocking, software issues, software upgrades, sim and memory card slot repairs, motherboard repairs, insurance claim reports and quotes etc. I also sell pouches, glass protectors, earphones and chargers, OTG cables compatible with all Samsung phones... SLICK CELLULAR SERVICES.... Situated in Bellville Cape Town. Open daily 8am to 10pm. Call or Whatsapp Kevin 0846389998. BBM D8A4EDB4. LinkedIn: Kevin Moodley. Email sos4cpt@gmail.com. Add me on Facebook: Kevin Slick Moodley. Facebook Page: Slick Cellular Cape Town. Facebook Page: Cell Phones Repairs Cape Town. Facebook Page: Slick Cellular Services. OR REPLY TO MY AD VIA GUMTREE MESSAGING. Selling extreme bass 31 Watts bluetooth portable speaker at R699 . Affordable alternative to the JBL flip speaker. Please note the indicated market price is over R2000. Has bluetooth, usb, FM Radio, TF card hands free call and Aux. Phone charge feature to charge your mobile phone. Stylish scratch resistant finish. View playback demo video here: https://youtu.be/jDkZinFlB2g Call or whatsapp only on 0742601136. Please no emails or Gumtree messages as I'm not always online to reply. Samsung original fast charger. Brand new & original. Two piece block & USB cable. Compatible for S6 S7 s8 s9 note4/5/8/9. And for most other phones that have a fast charging feature. R750. Call or Whatsapp Kevin 0846389998. BBM D8A4EDB4. Email sos4cpt@gmail.com. Add me on Facebook KEVIN SLICK MOODLEY Or reply to my ad via Gumtree messaging.